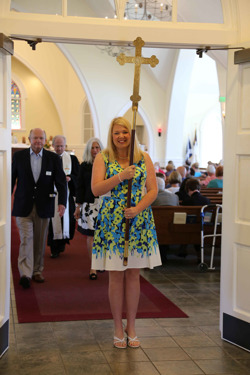 People come to St. Andrew in everything from beach clothes to their Sunday best, and everybody is welcome. You'll find special bulletins and coloring books for children, listening devices for the hearing-impaired, and lots of warmth. Many people say that it feels like coming home. We hope that worship at St. Andrew is traditional, relaxed, joyful, reverent. Our church observes seasons and special days of the Christian Year, such as Advent, Epiphany, Lent, Easter, and Pentecost. This leads us through the life of Christ, from his birth to resurrection and ascension, and then to the birth of the Church. For the most part, we follow a calendar of scripture readings called the Revised Common Lectionary, which is used by many denominations. We believe that worship is an offering, not a performance. Everything else that we do grows out of our worship together. Here's a little more about our church from the Mobile Press-Register.